Disclaimer: I am a Young Living Distributor and make a commission from sales through my business. All thoughts and opinions are my own. I'm a bit of a natural product junkie. I love trying new skin and beauty products — especially from companies I love and trust. 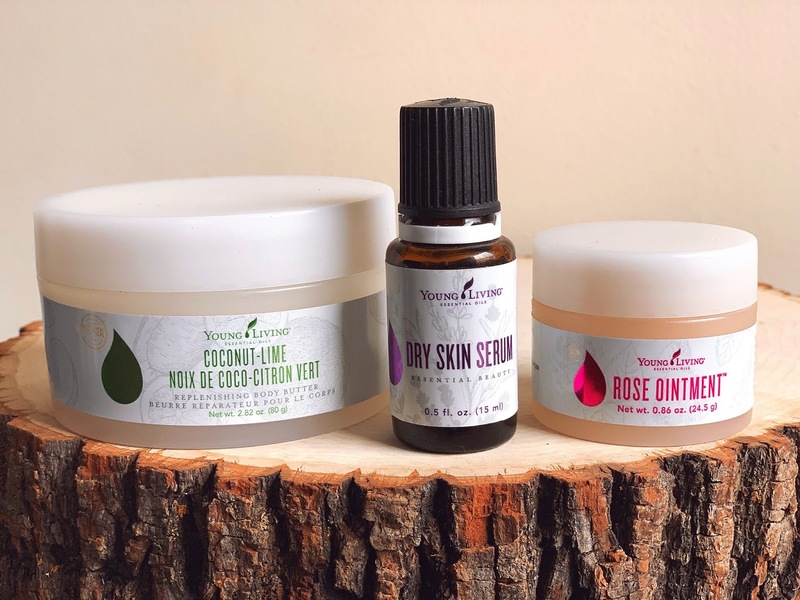 These 3 essential oil infused products from Young Living are saving my skin this winter, and I had to tell you about them! I started using the Essential Beauty Dry Skin Serum just before Christmas. Essential Beauty Serum (Dry) contains Cedarwood, Coconut, Jojoba, + Avocado oils, Blue Cypress, Rosehip, Lavender, Myrrh, Clove, Wolfberry, and Royal Hawaiian Sandalwood. For a super luxe addition, you can add 3 to 5 drops to your daily moisturizer and apply to your face and neck or as a spot treatment. I popped a roller fitment on top and roll along my t-zone 1-2 times a day. Young Living Rose Ointment is a deeply nourishing blend for dry skin. It’s also a super affordable way (under $25 wholesale!) to experience Rose essential oil. The Rose oil in this ointment helps to improve skin texture, while Tea Tree works to soothe irritated or rough skin. Along with Geranium, Ylang Ylang, and other favorite floral oils, it has a surprisingly subtle floral aroma. I actually smell the Patchouli in it a little stronger. Overall, it’s not an overpowering scent, as a lot of Rose products can be. I use this ointment on my lips and cuticles. Last, but not least, is my favorite of these three products — the Coconut-Lime Replenishing Body Butter! I LOVE THIS PRODUCT, ya'll!! First of all, it legitimately smells good enough to eat. It looks good enough to eat too, but I wouldn't advise it. If you like body butters, you are going love this one. Made with mango and cupuacu butters (and no added water! ), this body butter has an incredibly luxurious feel—helping your skin stay hydrated and smooth. I am obsessed with the fresh, citrusy, tropical scent. It’s vegan-friendly, with 100% plant-based ingredients, including Lime, Lemon Myrtle, Orange, Tangerine, Grapefruit, Lemon, Mandarin, and Spearmint essential oils. I rub this all over after my bath or shower, but especially on my knees and elbows. My skin looks clearer and more radiant, which I especially appreciate this time of year. If you are completely new to essential oils and are interested in learning more, please shoot me an email so we can chat! We'd love for you to join our community! You can order your Premium Starter Kit here!